Spain will crown a FIRS Roller Derby World Champion in two years. So where's that FIRS Roller Derby rule book? [UPDATE – 3/22/16] Roller Games 2017 will not be held in Spain as originally announced, but instead in Nanjing, China. Barcelona will instead host in 2019. For more on this news update, click here. 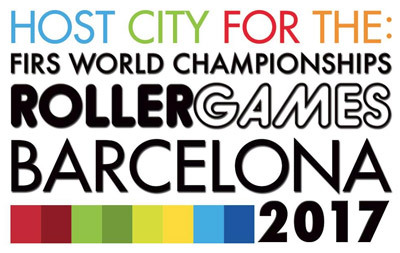 The International Roller Skating Federation (FIRS) has announced that Barcelona, Spain will host Roller Games, the first combined FIRS world championships, in 2017. Among the events on the Roller Games program is roller derby. FIRS President Sabatino Aracu revealed Barcelona as the winning city at the bi-annual FIRS Congress, held this past weekend in Rome, Italy. Barcelona was selected over Lima, Peru for the right to host the competition. The Roller Games, a two-week long Olympic/X-Games inspired event, are being positioned as a centerpiece that can demonstrate how roller sports and its varied disciplines makes for exciting competition, generates interest, and fosters long-term participation from young athletes. These together, FIRS believes, is the key to ensuring consistent and stable growth in roller sports worldwide. The timing could not be better for FIRS. As we previously reported, roller sports (and maybe roller derby) could be included in the 2024 Olympic program under new reforms passed by the International Olympic Committee. But it turns out that those same reforms are giving FIRS a chance to have roller sports added to the 2020 Tokyo Games, provided its bid is accepted by Japanese organizers over other potential events like baseball/softball, karate, or surfing. During their bi-annual Congress, FIRS also revealed a new logo and the promise of a modernized rollersports.org website. FIRS is confident that it could make it in as soon as 2020, having staged a successful showing of roller sports during the Youth Olympic Games in China last year. It went so well, Chinese authorities immediately agreed to bid for future FIRS world championships in 2016 and 2018, and Roller Games in 2019. Along with the inaugural 2017 event, FIRS hopes the roll it has been on lately will lend to its case for eventual Olympic inclusion. But we’re getting ahead of ourselves a bit. First things first, FIRS needs to decide what kind of roller derby it will put into competition for Roller Games and any future annual roller derby world championships. A decision on this will need to be made soon. The 100-plus national roller sports federations that are members of FIRS, should they decide to field a roller derby team, will need time to install a national structure for derby, if it doesn’t already exist; select (or partner with existing) men’s and women’s national teams; build up a base of certified coaches and officials; and allocate funds to support training and travel, among other things. Plus, we haven’t even got to the most obvious question about roller derby at Roller Games: What rules will participants play by? There is no clear answer to this question yet2, but it is certain that there will be one forthcoming in the near future. FIRS has had an international roller derby technical committee, CIRD, for a few years now, and pretty soon we’re going to see what kind of derby the organization believes will best promote roller skating to the world. During the FIRS Congress, the host candidate cities gave their pitches in front of representatives from over 60 countries. These proposals included arenas with seating in the thousands to host the roller derby competition (and every other event).3 Local dignitaries seemed convinced that there would be enough excitement in town to fill them. For existing FIRS roller sports disciplines, particularly speed, hockey, and figure, things will be moving fast between now and 2017 to prepare for a potential world audience, the likes of which it has never seen before. For FIRS Roller Derby, things will need to happen even faster if it wants to come along for the ride. RollerDerbyNotes.com will keep a look out for any new developments on roller derby at Roller Games and report on any updates. This sounds like exciting times. Do you know if they have specified if is is to be men’s or women’s roller derby? Presumably both, like every other sport. Hmm, well I have to say that the FIRS president Sabatino Aracu has a pretty shady reputation as a politician, to say the least. And that FIRS seem to have a very hierarchical decision making system, where the FIRS president wields pretty much all the power, directly or indirectly. A president with power isn’t a bad thing, though. If a guy has a vision, and one that benefits everyone, all the better that he is in a position to make it happen. Aracu is clear that he wants roller sports to be in the Olympics, and under his watch it’s as close to happening as it’s been since they actually got there, briefly, in 1992. If it’s working, it’s working. He has previously said “Do not allow these people to organise themselves” regarding skateboarding. Do we really want our sport to become his? Remember when inline downhill was in the X Games? Atomatrix does. There’s no guarantee it will be WFTDA rules, and in fact the odds may be against it. See the second half of this article for why. Had Lima won the bid, it would have held preliminary competitions in smaller facilities, but held the competition finals of most disciplines, including derby, in the 12,000-seat arena it is using for the 2019 Pan-Am games. That would have been something to see!